In his book “ishmael” Daniel Quinn writes that the biblical story of Kain and Abel is an allegory on the sedentary peasants fighting the foragers (i.e. hunter-gatherers). I don’t know if Abel Is Dying know this book or if they are referring to the original biblical text but I know that Quinn’s book is highly recommended within the north American vegan straight edge community and people involved in Earth First! and similar things. 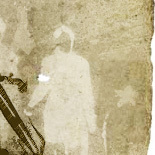 On the photo in the booklet one of the band’s members is wearing an ALF shirt so maybe my Quinn connection is guessed well.